In the wake of the #MeToo movement spreading to Tamil cinema, one of the first names to be accused of sexual harassment was National Award-winning lyricist Vairamuthu. After being outed by singer Chinmayi and a slew of other anonymous accounts, the lyricist expressed his outright denial of the accusations and asked his accusers to take the legal action if he was in the wrong. While a lot of varying opinions on this issue were being discussed in the media, and outside, the family of Vairamuthu had maintained a stoic silence throughout. 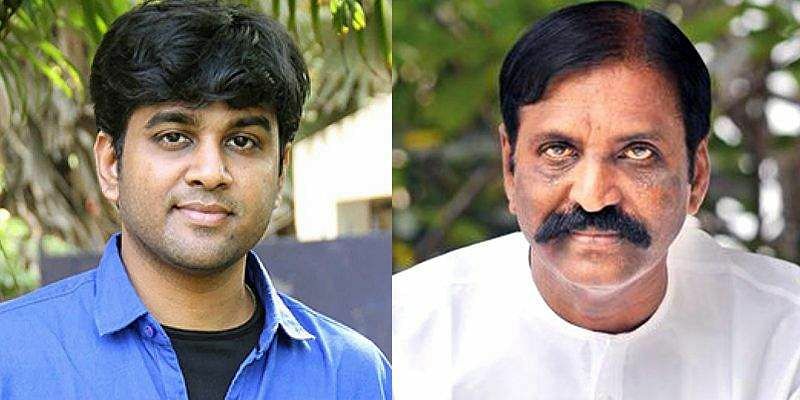 However, on Sunday, Kabilan Vairamuthu, the younger son of the 64-year-old lyricist, broke his silence and came out in support of his father with a long post explaining his stand about the issue. Issuing the statement in defence his father, Kabilan said that while some say there are vested motives behind the allegations and others say there isn't any, it is imperative that every allegation is legally sustainable. In the detailed statement, titled Unmai Vellatum (Let Truth triumph), Kabilan traces the humble beginnings of his lyricist father and talks about his hard-earned fame and wealth. Summarising the hardships Vairamuthu faced to achieve all his laurels, Kabilan said that his father's journey gives a lot of hope to youngsters, and the life he has lived so far is more glorious than his works and words. Kabilan blames Western influences for threatening to damage the Indian family system, which has ensured 'the economic stability' of the country. Heaping praise on the country's women's rights organisations, Kabilan says that these organisations have always strived hard to uphold the traditional values of India, unlike Western organisations that are hoping to break down the Indian family set-up with this movement that targets men and women without any evidence or a long-term vision. Referring to the calling out of abusers and harassers on social media, as a 'dangerous trend', Kabilan said, the #MeToo movement and the allegations that are tumbling one after the other are diverting people's attention from more pressing issues that are plaguing the country. While Vairamuthu's other son, Madhan Karky hasn't yet come out with an official statement, he retweeted Kabilan's statement on Twitter.